I like to clear the dining room table to dump my wax pieces on and sort by size. 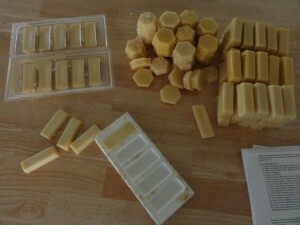 I print out a page that gives uses and ideas on what beeswax can be used for. I cut and fold the pages and baggie the paper with the 1oz pieces. All set to box and deliver to my friends, Joli and Cecil, for delivery next week. It’s my part of what I can do to donate something beneficial to the club and educational to the public. Come get yours for $1.00 each at the Kansas State Fair. 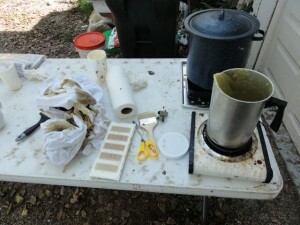 Boiling the beeswax down outside, of course. 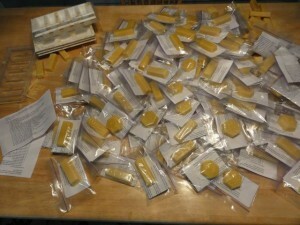 Unmolding and counting the beeswax pieces. This entry was posted in Beeswax, Value Added Products by Robert. Bookmark the permalink.